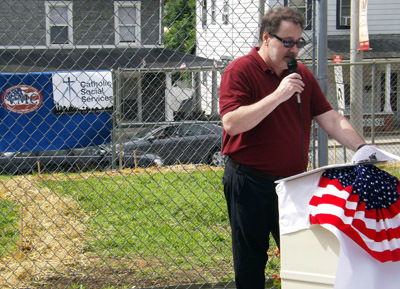 The mission to end homelessness for military veterans in the Philadelphia region took a big step forward with the June 30 groundbreaking of a new facility in Coatesville, in partnership with Catholic Social Services (CSS) of the Archdiocese of Philadelphia. 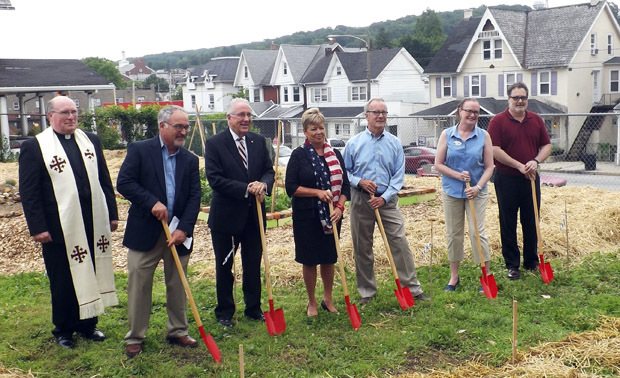 Operating Base Cecilia, the service center for military veterans that has been located since late 2013 at the former St. Cecilia School in Coatesville, will expand its offerings with the addition of a produce garden and storage building at the site at 605 East Lincoln Highway. The headquarters for the Supportive Services for Veteran Families (SSVF) program serves Bucks, Delaware, Montgomery and Chester counties. Operating Base Cecilia is a joint initiative of the Veterans Multi-Service Center (VMC) federal program and CSS. The program reaches out to homeless veterans, or those at risk of becoming homeless, using a “housing first” model focused on getting them and their families into stable permanent housing and back on track to a more secure future. The local efforts are part of a nationwide initiative to end veteran homelessness by the end of this year. In its first full year of operations, Operating Base Cecilia reached 237 veterans along with 113 of their spouses and children. Once homeless or at risk of becoming homeless, 85 percent of these former servicemen and women are now in secure, stable, permanent housing. 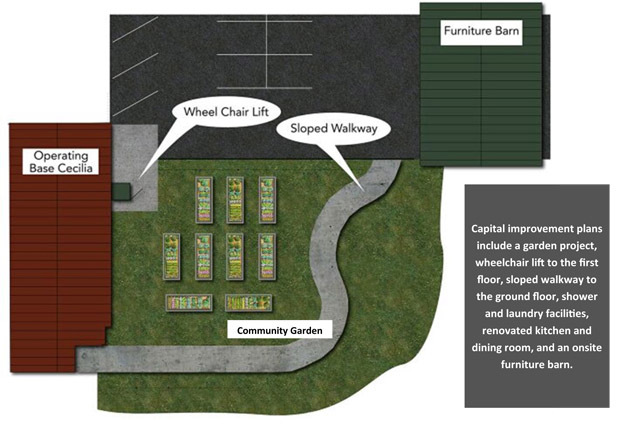 Projects planned for Operating Base Cecilia include an urban farming garden, a sloped walkway running through the garden with access to the building’s ground floor, a wheelchair lift with access to the first floor, a furniture barn to provide on-site storage of donated household items and renovation of kitchen facilities. Rick Pytlewski, CSS administrator for Chester and Delaware counties, lauded the CSS/VMC partnership’s staff for their collaborative efforts to “successfully help hundreds of veterans prevent ills or break the cycle of homelessness in the five-county area,” he said, referring to the suburban counties plus Philadelphia. The planned projects should be completed by this coming Veteran’s Day, Nov. 11, Pytlewski said. Maura “Mo” Gillen, the deputy executive director for VMC, thanked all the staff members and volunteers involved with Operating Base Cecilia, as well as other organizations who have contributed time and donations to making the projects happen. “We have come together to better serve those who have served our country, and now need a little help — veterans who have fallen on hard times, suffered distress from their service, or just gotten off track and need a ‘sister or brother’ who understands and can provide a little assistance,” she said. Gillen is a veteran herself, having retired after serving 27 years of active duty in the U.S. Army and rising to the rank of lieutenant colonel. The name for Operating Base Cecilia was derived from military terminology that is used to designate certain bases for a specific mission, Gillen explained. “We are here on a mission; the current mission is ending homelessness,” she added. For more information, call 610-384-VETS. A diagram shows the planned expansion of the Operating Base Cecilia facility.